We compare car rental prices in 30,000 world car hire locations so you don’t have to do it yourself now. Experience the city with our car rental Lugo or Santiago De Compostela Airport rental cars. Use the web form to add your location and get the best deal for cheap and reliable rental car! Our links with top car rental suppliers guarantee the most affordable price for your dream car! With car rental Lugo you can explore the world famous site - Lugo City Wall of Roman period. You can also relax in ancient Roman baths now located on one’s sanatorium territory. 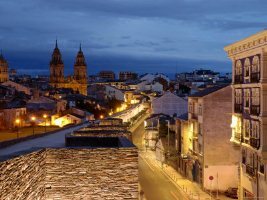 Lugo is a very ancient city founded in I century B.C. so you’ll find there lots of historical architecture which drives back in time! RentalCars24h.com offers you reliable car rental Lugo services that will help you to feel free and independent when moving around the town. Providing best online prices for car hire Lugo services, RentalCars24h.com allows you to save money each time when you rent a car in Lugo.